Carine qualified as a veterinarian from Liège University (Belgium) in 2006. During 5 years, Carine worked as nutrition delegate in pet food industry. During this time, she gained knowledge in one of her favourite topics: nutrition. 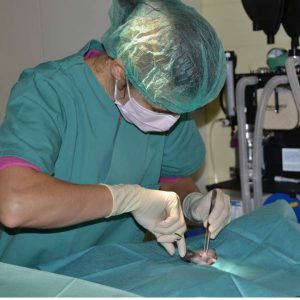 Since 2011, Carine is practicing veterinary medicine for small animals and more specifically in the fields of internal medicine, urgent care, surgery and dentistry. Carine is passionate about the complex system that represents each living being. She puts the accent on the time taken with each patient and his owner: during her consultations she gives suggestions and prevention tools to the owner in order to avoid recidivism and to guarantee an overall improvement of the animal’s health. By welcoming Carine within the team, consultations in Natural Medicine can now be combined, if necessary, with consultations in Internal Medicine, blood analysis, surgeries, dentistry or urgent care for small animals. This is what Natural Integrative Medicine is about: putting our strengths together in order to offer your animal the best services.